Here's one thing that we just don't get about Zombies; they last for what seems like forever as long as they don't get shot in the head but they are also always in a state of decomposition. Dead flesh can get eaten by all sorts of bugs and insects so wouldn't the just rot away and disappear? Maybe we're overthinking this. We like zombie movies a lot and sometimes things are just best left untouched by silly scientific fact (who needs it?). We've always been in full support of seeing various body parts just hanging on by a thread in those shoes because nothing amps up the gross quite like an eyeball out of its socket. Throw on this easy to use latex makeup kit and you'll become a real anomaly in the scientific world with your own version of the classic horde monster. Don't forget to bloody yourself up with a few other makeup kits and always remember to look both ways before crossing the street to get to the other side. 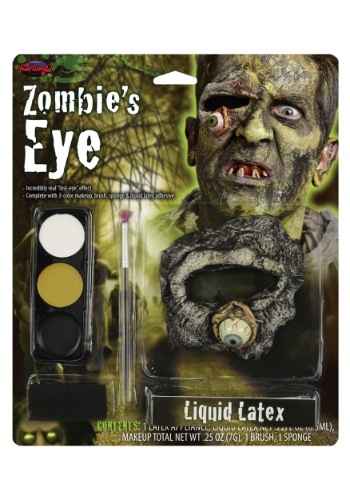 just a little undead humor for you paired with the fact that it's difficult to do with one eye. Man we really killed it with the explanation.